As a Sedaris fan, I was initially disappointed with this collection of his diary entries but ultimately became delighted. His open eyes and listening ears find something interesting everywhere. The early diary entries are rather short and depressing. I almost considered setting the book aside unfinished. However, the further into the timeline you read, the longer and more engaging the selected diary entries become. This is no exercise in naval gazing. Sedaris doesn’t focus on his feelings but on everything around him. Oh, he may have a reaction to record (and share), but it’s the outside world that engages him. You learn more about his family dynamics, including the tragic problems of one sister and his father’s gruffness. You also realize how much physical labor was a part of his life. But ultimate, it’s Seradis’ wide-eyed observance of the people and things around him that keep you turning the pages. I was especially delighted that he included more about the spiders he named, fed, and watched over in his rural French home. Those notes alone give you an idea of the eccentric fun to be found in this volume. The years in these diaries, 1977-2002, start with the years of struggle as a young man tries to find his way. The end with his exceptional success. However, not even the hard years are painful to read about because Sedaris continually records the confounding and bizarre people and events he encounters. You can find a lot more about this David Sedaris book by clicking on the NPR interview here. Who would think that a novel about house imprisonment in Communist Russia could provide such a delightful escape for readers today? But the luxurious Hotel Metropol is not your typical home, and the erudite Count Rostov is certainly no despairing inmate. He finds pleasure, purpose, and invaluable companionship in the course of this novel. And, so will you. To call this a soufflé of a book would be untrue. Though light in spirit and tasty in its details, there is a continual tension between the hero’s esthetic and Bolshevik goals. The Metropol provides the perfect setting for these two to interact — supporting the aristocratic tastes of the former while bending to the demands of the latter. 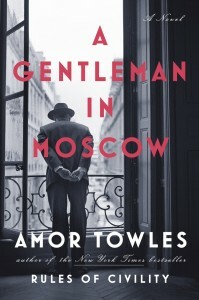 Towles tips his hat to the great Russian writers, including a gun appearing in the first act, and an amusing discussion about confusing Russian names (unsurprisingly, many found in this book are also found in War and Peace). Count Rostov is on trial for, basically, the crime of being a count. However, in his youth he wrote a well know poem in support of the revolution, so instead he is confined for life to the Metropol, where he has a fine suite of rooms. Of course, he must now live in cramped attic quarters. But the Count firmly believes if you do not master your circumstances you will be mastered by them. And, he proceeds to do just that. Like a gentleman. For more about Towles and his book, click here. First of all, the title is largely misleading — these ladies were sometimes embraced and honored by their communities and followers; and very few of them were royalty of any sort. However, Porath’s point is to replace pampered pink princesses with stories of powerful women who needed no princes to rescue them. They took care of business themselves. As some of the stories are beyond a “G” rating, Porath not only starts with the most G-rated stories but also includes color-coding for each story regarding issues like violence and adult situations, making it easy for parents who want to read these stories to their children. And, kids will like them as these action-packed, amazing stories include pirates, doctors, leaders of all sorts, warriors, athletes — 100 incredible women in all. Porath came from the world of animation, so it’s no surprise there are full-page color illustrations alongside the tales. Whether you read it by yourself or aloud to others, you’re bound to next turn to the Internet to find out more about the exceptional women who populate these pages. Well, there is no plot, just 100 stories about women who made history — or should have. For more about Porath and this book, click here. As the third book in Ghosh’s fascinating historical novels built around the East India Company’s opium trade, this book brings closure to many of the ongoing storylines involving the fictional characters (there are plenty of real ones, too). It’s an intriguing read, but not for anyone who is bamboozled by words in other languages — there’s lots of pidgin phrases and words, but you can almost always tell the meaning by context. Most of us are vaguely aware of the Opium Wars between China and England. This book (and the others in the Ibis Trilogy: Sea of Poppies and River of Smoke) not only fully opens your eyes but drops your jaw. The audacity and power of the East India Company are simply mind-blowing. They argued they had a God-given right to sell opium to the Chinese and no Chinese Emperor had any business stopping them. And, the British government and military backed them up. Ghosh’s story is presented through the adventures of a number of characters — Indian, British, even an American. There’s romance, scheming, endless greed, shocking revelations, and some highly intriguing minor characters, along with actual battles. Ghosh’s research is extensive and the most shocking statements by those insisting on the opium trade are drawn word-for-word from actual documents. I readily admit this outing is not nearly as page-turning as his first book in the series, but it’s still a rewarding read. There are several main plot lines involving an Indian sepoy in the East India Company’s army, the grieving widow of an Indian opium trader, and an ambitious American sailor. All three wind up sailing to China, involved, one way or another, in the outcome of the pending Opium Wars. For more about Amitav Ghosh and his work, click here.